Q. Hello, can you tell me a bit about you both? A. My name is Jo and I am from Matlock in Derbyshire and my husband’s name is Simon. He is from London and we both live and work in London at the moment. Q. How long had you been engaged for before you started looking for a wedding venue? A. Simon and I got engaged in January 2015. He proposed to me at my favourite place in London, St Paul’s Cathedral. 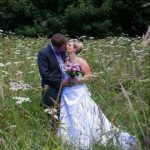 We started looking for a Peak District wedding venue straight away as we were very excited to get married and knew that venues can take a long time to find and are often booked up very quickly. Q. When you were searching for a venue, what were you looking for and where? A. We were looking for a venue close to Matlock in Derbyshire, in the Peak District, that was relaxed and that we could do everything ourselves. Our main google words were Peak District wedding venue, countryside, Derbyshire, rustic, vintage, DIY, relaxed, unique. Q. What appealed about Hargate Hall when you first found us? A. Everything. We absolutely fell in love with it. 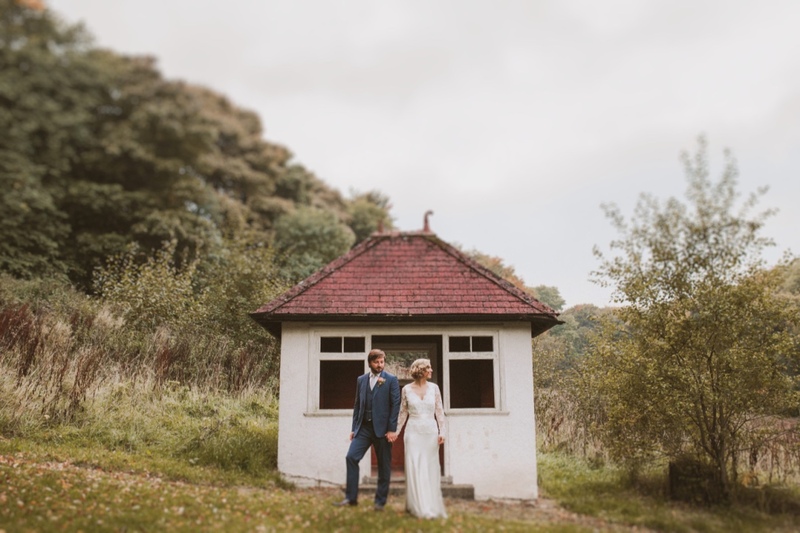 From the location – in the beautiful Peak District countryside, right next to Miller’s Dale – to the relaxed, unique, fun feel of the venue. We loved the main hall, with the beautiful wood and classic stairwell, we loved the fun and vintage style of the upstairs lounge, which Simon immediately fell in love with as he saw it as his whiskey and cheese room, we loved that the marquee allows for a separate venue for the food and we loved the fire pit. Most of all we loved the feel of the Hall – it had so much character, yet still maintained its classic style. Q. What did you think when you first came to look around? (i.e. better, worse, or same as you expected? A. Definitely better than we thought. So much bigger and more stylish. Also the grounds were really beautiful. Q. 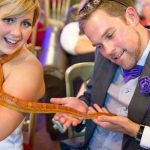 Did you have any doubts or concerns letting yourself in for compared to a “traditional” Peak District wedding venue? A. No we were very keen on having a unique DIY venue. We did realise though that we would have to think very carefully about the logistics of how we would make everything work. The things we were most concerned about were the bar and the food. The bar we were worried about how we get bar staff, the amount of glasses we needed in the two venues and how we would wash glasses. We ended up with more glasses than we used without washing any so we planned well. In regards to the food, we were getting married off site so were concerned about the caterers arriving at the venue with none of the party to meet them or help them set up. This again turned out all fine. Q. What was your plan for your Peak District Wedding Weekend? A. 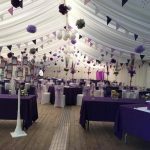 We planned for the set-up party arrived as early as possible on the Friday to set the marquee, decorate the hall, receive the Tesco order, set the bar and sort the rooms for everyone. Simon was then doing a Ragu for guests arriving that evening and I went home to Matlock for an early night and to get ready for the wedding day. 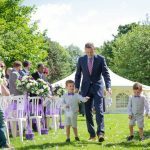 On the morning of the wedding, my bridesmaids and I got ready at our cottage in Matlock and Simon got ready at Hargate hall. A bus took everyone to the church in Cromford for the wedding ceremony and returned to Hargate afterwards. We provided vintage champagne glasses for all of our guests (from charity shops) as gifts and as they arrived we filled them with French champagne. After that, we had our local curry house cater and they brought around samosas and starters in the hall. Then we had speeches straight away so that everyone could relax and have a big party straight after. We served curry and wine in the Marquee and then the band started and we danced most of the night. We had sparklers outside in the band interlude and after they had finished we lit a fire and had marshmallows around the fire. Q. Did everything go to plan? A. Most things went to plan. We had less time to set up as most of the people who were going to help us set up only arrived as the guests were arriving due to traffic on the M1. This meant a couple of things that we had planned did not get done and everything was quite rushed. Also many people were a little worst for wears on the Sunday so we did not have the full capacity of people helping us clean up. Apart from that everything ran perfectly. Q. Was it more, or less effort, than you thought and was it worth it? A. It was certainly more effort that we thought it was. I think that was more because of the time you are allowed in to set up the venue (4pm is quite late to set up everything when the wedding is the next day and guest arrive on site from about 7.30) added to the number of people we had helping us set up, given the traffic. It was definitely worth it though! Without a shadow of a doubt. Q. Would you do anything differently? A. I think in hindsight I would have paid for an extra day to have the hall or the marquee. With this, we could have had a more relaxed and less stressful setup. As I say, 4pm was just not really enough time to sort the marquee, bar, hall, cheese and wine room, gin room and everyone’s accommodation when guests arrive that evening). Q. How would you describe Hargate Hall? A. Beautiful, interesting, original, stylish, fun and above all one of a kind! Q. And finally, because we are different to a lot of other venues, do you have any advice to others starting out on their wedding planning? A. My advice for planning a wedding would always be to make your wedding true to yourselves – that is why Hargate is perfect! It takes a lot more time and effort than a package wedding, but it is worth it. You can make your wedding unique and individually you. Get as many people as possible to help decorate and clean up. We were so rushed doing it on the Friday, that loads of bits had to be abandoned. Do as much as you can before you arrive. We did most before we arrived on the decoration front – but signs and directions had to be abandoned as we just didn’t have time in the end. It definitely didn’t matter but worth remembering. Have point people for every part of the day and have a sheet with all their numbers and tasks – this worked really, really, well and took the stress off. Make sure you have people for the clean-up as on a hangover it is pretty tough work! Remember to tell people to bring towels. Thank you both very much for your time. I am sure others will find your advice very helpful. Searching for a DIY wedding venue. A. Our names are Paul and Marie were from Mansfield and have been together 5 years we have a little boy who’s 3 years old. A. We wanted a DIY wedding because we had an idea of what we wanted and didn’t want a traditional format. We looked on Google, and went to a few wedding fayres. Q. What did you think when you first came to look around? A. It exceeded anything that we thought it would be we were so happy that we found it and it was perfect. Q. What was your plan for your DIY wedding weekend. A. We wanted all our family and friends to have a get together the Friday evening so everybody knew each other we had a Chinese and a few drinks. The next day we had the ceremony at 2pm afterwards we had a buffet by a company we saw at Clumber park food and drink festival. Then the pictures were taken we all had a few drinks while the disco was set up. We had a fish and chip van and an ice cream cart for the evening which went down well and no washing any pots. On the Sunday, we had a chilled-out day and hired a hog roast from the same company that did our buffet. Q. 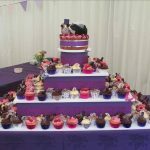 Being a DIY wedding, was it more effort than you thought and was it worth it? A. It was a lot of effort but everyone got involved and it was lovely as there was a bit of everyone’s efforts involved to make our special day extra special. A. The most perfect wedding venue ever. Anthony and Julie are amazing too we could ask any question and they helped out so much. Thank you for making our wedding so special and memorable our friends and family talk about it all the time. Q. And finally do you have any advice to others starting out on their wedding planning? A. We wanted somewhere where all our guests could stay. We wanted somewhere, perhaps not a traditional wedding place, where we could do our own thing. The accommodation was the main thing we searched for, initially looking at groups of holiday cottages with somewhere for a wedding within walking distance. A. Beautiful building obviously. You Anthony, to be honest. You were very helpful and enthusiastic and laid back, I had grown weary of venues telling me “and this is the door you will use for photos” … I’ll take photos wherever I bloody want thank you! Also the ability to party all night, we didn’t need to go all night, but so many venues make you turn the music off at 11!! 11?!?! How fun is that?! Q. What did you think when you first came to look around? 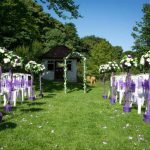 Did you have any doubts or concerns about what you might be letting yourself in for compared to a “traditional” wedding venue? Q. What was your plan for your wedding weekend. Q. Was it more, or less, effort than you thought, and was it worth it? A. LOL yes!!!! OMG so much work. But my own doing. A. Friendly, beautiful, fantastic, magical. A. Make a spreadsheet with everything you want and work through it month by month. Also think seriously about how it will all come together on the day, and how you will actually achieve that. Zoe and Sam, thank you very much. They have also shared some pictures from their wedding.